(Minghui.org) Because my wife refuses to renounce Falun Gong (also known as Falun Dafa), she was detained, suspended from work with no pay, and deprived of her personal freedom. Our family also suffered. In April of 2004, the security section of our workplace notified her that she had been suspended from work and she must go to the Shuangqueqiao Police Station. They tried to force her to denounce Falun Gong. She refused. At the time, I thought she was too stubborn. The Communist Party Secretary in our bureau asked me to persuade her to give up Falun Gong. I tried but didn’t have any luck. I couldn’t understand why she insisted on practicing Falun Gong, and I even got quite angry with her. However, gradually I understood that my wife didn’t do anything wrong in practicing Falun Gong. Another time, when my wife was at work, she was summoned by someone from the security section. As soon as she came out of the office, she was unlawfully arrested by police and detained for over 20 days. I told the head of our bureau that my wife was taken out of work even though she didn’t do anything wrong. I demanded that the bureau chief come with me to the police station to get her released. He assigned someone from the security section to come with me. When we arrived, I asked the officers why they arrested and detained my wife, since she did not break the law. Seeing that I was very firm, they released her. Nevertheless, she was later arrested multiple times. In 2005, we returned to my hometown to join a housewarming celebration for my older brother. My wife was in town distributing handouts about Falun Gong and the persecution, for which she was reported to the police. They arrested her and sent her to Wuchang Female Drug Addiction Treatment Center for detention. Later, she was sent to Shayang Forced Labor Camp for a year and a half. I was really angry with the endless unlawful arrests and detention of my wife. First, the police abused their power by arresting and sentencing innocent people at will. Secondly, they treated the law as child’s play, and nothing they did was by the rule of law. I used to believe everything the Communist Party said. Later, from witnessing the numerous ways in which my wife had benefited from practicing Falun Gong, I knew that the persecution is wrong. 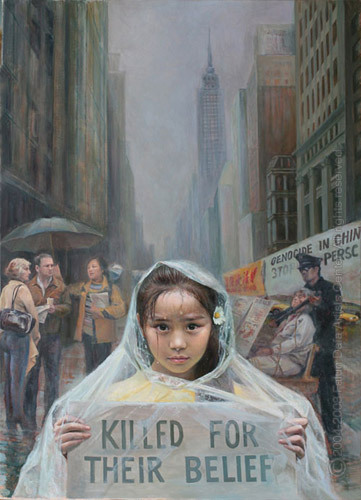 Falun Gong only teaches people to be good and does not break the law whatsoever. My wife had all kinds of illnesses before she started practicing Falun Gong, including adnexitis, gastritis, and dizziness. She had to go to the hospital often and spent thousands of yuan a year in medical fees. After she started practicing Falun Gong, she never had to go to the hospital again. Even my own severe stomach problems disappeared. I’m in very good health now. I could not feel more grateful to Falun Gong when an incident happened in April of this year. My grandson accidentally fell from the fourth floor. It’s incredible that he suffered only a fractured pelvis. I can never figure out how he was tangled up in a cable line closely affixed to our building when he fell from such a height. I have no doubt that my little guy was blessed because of my wife’s practice of Falun Gong. Falun Gong is so good. There is nothing wrong with practicing Falun Gong. I want to call on all Chinese people to break from the Communist Party and stand up for innocent people’s right to freedom of belief. (Minghui.org) Because of my poor health, I started to practice Falun Dafa years ago. This became a major event in my life. I was introduced to a different qigong practice for fitness in 1996, but it didn’t help much. Then two Falun Dafa practitioners came to my beauty shop for a hair cut, and they told me how good Falun Dafa was. But I thought that it was probably just another qigong practice like the one before. However, because they were so sincere, and they offered to teach the practice free of charge, I was reluctant to refuse. I also told them I was interested in reading more about it. Through reading Zhuan Falun later, I learned that Falun Dafa was totally different from what I had practiced previously. Falun Dafa taught people how to cultivate themselves. Zhuan Falun covers many topics, such as why people have illnesses, why people should be good, and why cultivation energy doesn’t increase with practice, among so many others. It also mentions that if you do everything according to the requirements in the book, it means that you are cultivating. I never knew any of this before, so I decided to learn Falun Dafa. The morning before I went out to learn the exercises, I had a vivid dream in which the practitioner who had introduced me to Falun Dafa did the exercises with me. I was about to get up in the dream when I felt my heart beating too fast for me to bear. I told her, “I often have this symptom, and my doctor has told me that it is arrhythmia.” That practitioner put her hand on my chest and we both closed our eyes as if trying to feel something. Then I noticed, from a distant horizon, a ball of something white and shiny dash into my chest, and immediately another ball went into my chest. Afterward, both of us seemed to have been awakened by a thunderclap. I opened my eyes and told her, “I just now heard a thunderclap.” But she said, “It was not a thunderclap; a Falun has been installed inside you.” Then I woke up. I got up quickly and went to the practice site. When I saw that practitioner, I told her my dream. She was pleased and said, “You have been connected with the Fa, so please try to do it well.” I started to learn the exercises from her. I became a new person by practicing Falun Dafa. All my ailments, such as headaches, neck pain, arthritis, chest tightness, a decade-long battle with chronic gastritis, and gynecological problems, were gone. Who has this ability to eliminate all these diseases? Only someone who is truly divine or a Buddha can do this. Zhuan Falun mentions that practitioners will experience their karma being eliminated. I had also been told by veteran practitioners that during the course of their cultivation they felt uncomfortable for a period of time, and it seemed as though they were ill. Sometimes they felt that their old diseases had returned, but they recovered without taking any medicine. Two months later at 11:30 p.m. one evening, I rushed to the bathroom and had loose bowels, having suddenly felt a severe pain in my belly. I went to the bathroom five or six times that night. At dawn, it was worse. I had a high fever with a splitting headache, neck pain, and lower abdominal pain. Even my bones hurt. I knew that I was experiencing karma elimination, so I wan’t scared. This lasted until the following midnight, when I suddenly woke up. When I opened my eyes and realized that all discomfort in my body was gone, I looked at the time: It was exactly 11:30 p.m. I was married at the age of 28 and got pregnant four times over the course of four years. Each pregnancy ended in a miscarriage at two months. I went to experts for different treatments, but nothing helped. Finally, I didn’t dare try any more to have children. These words reached my ears and seemed to wake me up. “Although I have started to cultivate, I still don’t dare try to have children,” I thought. “Is it because I haven’t completely believed in Master and the Fa?” Having realized this, I put my heart at ease and let it be. In a dream in October 1999, I saw Master float into my house from outside. Master was all smiles. I woke up at dawn, still immersed in the joy of this dream. And in that month, I again became pregnant. After about two months, I started to have back pain and abdominal pain, just like I had previously. At that time, my head suddenly felt swollen, but I immediately thought of Master and Dafa. Being a practitioner, I didn’t go to the hospital. Since I believed in Master and Dafa, I struggled between being firm and being restless. I endured until my due date, and the entire process was just as it should have been. Our daugher is intelligent and lovely, and the whole family is happy. With Master’s and Dafa’s care, she is growing up day by day. On my way home from a relative’s house on the evening of October 28, 2003, I was hit from behind by a car. With the sound of a “bang,” something big and hard hit the back of my head and I lost consciousness. As I came to, a fretful voice reached my ears. “She was hit on the head,” the voice said. On hearing the voice, I woke up as if from a dream. I realized that I was involved in a car accident, but I immediately recognized that I was a practitioner and that nothing bad would happen to me. A man and a woman helped me up. The woman driver said, her voice shaking, “Please get up and sit in the car; we will take you to the hospital.” I remembered that the back of my head had been hit very hard, so I deliberately shook my head, but didn’t feel dizzy. I touched my head but did not find anything swollen. I pressed my head but did not feel any pain. I was not afraid, felt at ease, and knew nothing terrible would happen to me. When I noticed that the driver was very nervous, I comforted her, saying, “It’s alright,” I said. “I’m fine. You don’t need to be afraid.” She was still nervous and kept asking me to go to the hospital. The driver seemed to smile a bit. I was taken aback when I turned to look at her car: The windshield was smashed. I said, “I’m sorry about your windshield.” The driver still apologized to me for the accident. I turned and headed home. I then noticed all the onlookers standing there in astonishment, speechless. (Minghui.org) Through word of mouth, Falun Gong (also known as Falun Dafa) spread rapidly throughout the city of Ningde in Fujian Province in the latter half of 1996. Falun Gong’s amazing ability to restore health and improve a person’s moral standard attracted many eager learners. Ms. Jin Liyan, an elderly lady, suffered from severe liver cirrhosis, chronic gastritis and frequent heart palpitations. These conditions left her weak and in constant pain. When she heard about Falun Gong, she immediately decided, “Wherever this practice is being taught, I will definitely go and attend.” This simple thought brought about an unexpected change. The previously weak and sickly lady suddenly was able to walk long distances without tiring. She located a Falun Gong practice site in January 1999. She then obtained Zhuan Falun, the book which contains the teachings of Falun Gong. However as an illiterate person, it seemed impossible for her to read that book within her lifetime. She remained undaunted and decided, “I will read this book.” It did not take long for her to recognize the words in the book. Within a few days of practicing the exercises, she had recovered from her illnesses and stopped taking all medication. Full of energy, she is now able to walk long distances without tiring. She benefited greatly from practicing Falun Gong. Ms. Fengyue, a middle aged lady, underwent surgery in March 2010 at a Fuzhou hospital for leg pain. The surgery failed to relieve her pain, and moreover caused her condition to worsen. Her leg muscles began to atrophy, and any physical movement brought pain. Over time, her condition deteriorated and doctors were left with no other option than to administer large doses of painkillers. The doctors prescribed a tuberculosis treatment, and suggested that she undergo a knee replacement surgery, which could cost up to eight million yuan. When they met again, the practitioner told her the facts behind the unlawful persecution of Falun Gong, before giving her Zhuan Falun, and teaching her the exercise movements. As she read the book and practiced the exercises, her health improved and one day she realized that she had become a healthy person. A 63-year-old lady suffered from various illnesses, including insomnia, hypertension and diabetes. To cure her worsening condition, her family members took her to medical specialists, but to no avail. Moreover, the increasing burden of her medical fees became a source of dispute between her husband and children. At the height of her desperation, she met a friend who practiced Falun Gong. This friend encouraged her to read Zhuan Falun, and gave her an MP3 player containing the lectures given by Master Li Hongzhi, the founder of Falun Gong. Filled with hope, this elderly lady read the book, listened to the lectures and did the exercises daily. Gradually, her quality of sleep and mental outlook began to improve. Skeptical of her outwardly improved health, her family insisted that she visit the hospital for a thorough examination. To their amazement, the medical report confirmed that she no longer suffered her chronic hypertension and diabetes. Filled with gratitude, this lady has devoted the rest of her life to practicing Falun Gong. Ms. Pan Feiliu once suffered from severe insomnia and chronic severe fatigue. She consulted many doctors and took large amounts of medication. However, her efforts were in vain. She met someone by chance in 1998 who gave her Zhuan Falun. She read the Falun Gong teachings, did the exercises and began to experience a gradual improvement in her physical condition. Not only did her body feel refreshingly lighter, but her mental character also underwent a major change. She became more compassionate and tolerant towards others. This improvement in body and mind cemented her conviction to practice Falun Gong. Ms. Pan and several Falun Gong practitioners went to Beijing in July 2000 to appeal for fairer treatment of Falun Gong and its practitioners. The authorities ignored her appeal, and instead arrested and imprisoned her for three-and-a-half years. She was tortured with methods such as being forced to stand for long hours without moving, to sleep deprivation and physical abuse. Psychotropic drugs were mixed into her food, and she suffered from frequent delirium, confusion and loss of mental control. The constant torture caused Ms. Pan’s weight to plummet from a 130 to a mere 70 pounds. Only when she was on the verge of death did the authorities agree to release her into the care of her family. After her release from prison, Ms. Pan diligently studied the teachings of Falun Gong and did the exercises. With her strong faith, she quickly recovered in body and mind. Ms. Liu Ruozhen started to practice Falun Gong in 1998. Within a few months, her joint rheumatism, stomach problems and other health issues disappeared. Since then, 17 years have passed, and she remains in perfect health and full of vitality. Before she started to practice Falun Gong, she had a bad temper and would often pick fights with her colleagues and parents-in-law. After practicing Falun Gong, she followed the principles of Truthfulness-Compassion-Forbearance in her daily life. She became kind and considerate toward others. As a result, her relationships with her colleagues, husband and parents-in-law became very harmonious. Her son also benefited from his mother’s practice of Falun Gong. Her son often fell ill and would come down with a high fever in the middle of the night. As the family lived in a rural area with poor medical facilities, locating a doctor was impossible at the late hours of the night. Ms. Liu resorted to practicing the Falun Gong exercises beside her son during those nights. His fever was gone within no time. Additionally, she noticed improvement in her son’s grades after she became a practitioner. From an initial high school ranking of 400, he went to the top of his class by the third year of high school and was admitted to a prestigious university. For Ms. Liu, the amazing power of Falun Gong cured her illness, changed her outlook on life, improved her interpersonal and family relationships, and helped her son. This is truly a practice that has beneficial effects for practitioners and their families! (Minghui.org) I am a young Falun Dafa disciple who started practicing in 2011. I went to visit my grandmother, who has practiced Dafa since 1995, because I had an intuitive feeling that it was important to see her. After I entered her home, I asked her to please read Dafa books to me. She smiled and put down Zhuan Falun. She picked up a book of cultivation stories and began to read aloud. “But those are just cultivation stories,” I said. “I want to read Zhuan Falun!” I picked up the book she had just put down and started to read. “This book is wonderful! Why didn’t you let me read it earlier?” I asked her. Soon after, my body began to be purified, as it is described in the book. On my way to school on my bicycle, I was hit by a speeding motorbike on two occasions. One time I fell off the bike and landed on my face in the middle of the road. That motorbike rider appeared extremely scared. His gas tank was damaged. However, I had only a minor skin injury. When I described the accidents to my grandmother, she said that Master had protected me. Since I had not practiced for long, my grandmother’s practice must have benefited me as well. There was also a time when I went with my father on a short hike. I tripped, lost my balance and rolled down the hill. My father watched in horror as I tumbled about 80 meters to the bottom. He thought I must have died, but he saw me stand up. He descended as quickly as possible. When he reached me, he noticed some scratches on my arms and legs, but there was no serious injury. My father hugged me and sobbed. He was so relieved that I was not seriously hurt. I knew that it was Master who had protected me again! After that incident, my father no longer objected to me practicing Dafa with my grandmother. Before I practiced Dafa, my grades were poor. While in middle school, I was ranked in the last eighth of my class. I began to practice as a freshman in high school. At the end of the first semester, the school posted a ranking of approximately 3,000 students. Many students shoved their way to the bulletin board, looking for their names. Initially, I was afraid to see my ranking. Eventually, I was able to see the list. I looked for my name, starting from the bottom, but I did not see my name there. I was ecstatic to find my name in the top third of the class! I am now in my third year of high school. My grades are in the top sixth of students. This has been a tremendous leap for me. This became reality because Master gave me wisdom. I am so grateful to Master! One day, her company hired three temporary workers to do some roofing maintenance. They rushed to finish the work so they could catch a train back to their hometown the next day. One of the workers kept running to the restroom because he suffered from an acute inflammation of the small intestines. My aunt told him to rest and recite, “Falun Dafa is good, Truthfulness-Compassion-Forbearance is good.” The worker took her advice. Within ten minutes, he felt much better and returned to work. The workers continued to work until 10:00 that night, and the one who had the affliction did not need to use the restroom more than normal. He said that he had recovered from his ailment. She told him the two sentences and gave him some truth-clarification materials. The worker thanked her. My grandmother has also told me many cultivation accounts over the years. I believe that Dafa truly is wonderful! I will continue to cultivate diligently.